The Wellesley Wine Press: 2010 Calera Central Coast Pinot Noir: QPR Alert? 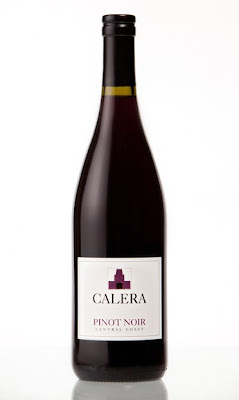 When Wine Spectator dropped a 93 point rating on the 2010 Calera Central Pinot Noir it was a second validation that this bottling has become one to be reckoned with in the California Pinot Noir value spectrum. The 2009 vintage was rated 92 points by the Wine Advocate, and combined with its modest $24 release price and relatively high production levels (around 10,000 cases) the wine seems destined to join the likes of Siduri and Loring as perennial Pinot value plays. I was just browsing through the Wine Spectator rating database and man...I had a hard time finding a 93 point California Pinot Noir for $25 or less. I had to go back into the early '90s to a time when Pinot was in its infancy in California and producers were just getting started with the grape to find a Pinot this affordable and highly rated. If we consult the wisdom of the masses we currently see a Cellar Tracker community rating for the 2009 at 89.1 and the 2010 is currently averaging 90.3. If we run these metrics through the WWP QPR Calculator (what's that?) we get a 2.5: A Very Good value. Primary [very] ripe plum notes mug the otherwise nice Pinot characteristics lurking in the background. 14.9% alcohol (up from 14.2% in 2009) and it shows. The wine clings heavily to the glass and there's heat at the backend of every sip. An instantaneous aerator the first night and an evening of rest under stopper didn't help accelerate the aging process. Will this be better with time? I wouldn't count on it. But for $24 retail it's a decent wine I guess. I just can't see my way to 92 or 93 points. Question of the Day: Have you had this wine? If so, what did you think?